Pharmaceutical Monographs, Volume 5: Immunological and Blood Products provides an introduction to immunology and immunological products. 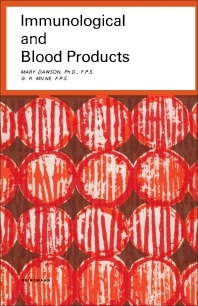 This monograph describes various tissue culture techniques, which are important both in the preparation and standardization of certain immunological products. Organized into two parts encompassing 13 chapters, this volume begins with an overview of the types of immunity. This text then examines the substances which when introduced parenterally into the tissues, stimulates the production of an antibody. Other chapters consider antibodies as substances appearing in the blood or body fluids in response to the stimulus provided by the introduction of an antigen. This monograph discusses as well the preparations capable of stimulating active immunity. The final chapter deals with the causation of hemolytic disease of the newborn. This monograph is a valuable resource for medical students as well as undergraduate students of pharmacy. Students of veterinary medicine will also find this book extremely useful.